The Presidents' Trophy is an award presented by the National Hockey League (NHL) to the team that finishes with the most points in the league during the regular season. If two teams tie for the most points, then the trophy goes to the team with the most wins. The winning team is also awarded $350,000 in cash bonuses. The Presidents' Trophy has been awarded 27 times to 15 different teams since first being awarded in 1985. The most recent winner is the New York Rangers for the 2014–15 NHL season. The trophy was introduced at the start of the 1985–86 NHL season by the league's Board of Governors. Before the 1985–86 NHL season, the best team in the league during the regular season was allowed to hang a banner stating "NHL League Champions". The winning team is also awarded 350,000 Canadian dollars, to be shared between the team and its players. The Presidents' Trophy winner is guaranteed home-ice advantage in all four rounds of the Stanley Cup playoffs, provided the team goes that far, so it remains the most likely position to produce the cup winner. From 1937 to 1968, the same rules now used for winning the Presidents' Trophy were used to award the Prince of Wales Trophy. 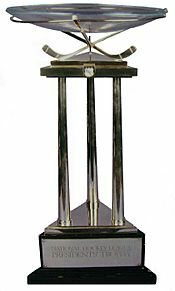 With the Modern Era expansion in the 1967–68 season and the start of the West Division, the Wales Trophy was awarded to the team that finished in first place in the East Division during the regular season. However, no trophy was awarded to the team that finished with the best overall record in the league during this period, and no trophy at all was awarded from the 1981–82 season through the 1984–85 season; the Wales and Campbell trophies were transferred to the playoff champions of those conferences in 1981–82. A cash bonus was given to each player on the team with the league's best regular-season record during these years, to which the Presidents' Trophy was added in 1985–86. The only team to have won the Presidents' Trophy more than twice is the Detroit Red Wings, with six. However, the Montreal Canadiens have finished first overall 21 times, the most times in league history, although they have yet to win the Presidents' Trophy. Detroit is second with 18 first-overall finishes. 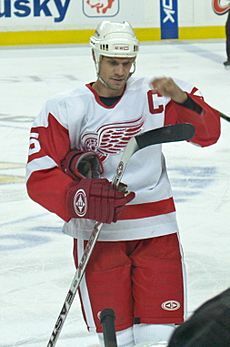 Nicklas Lidstrom of the Detroit Red Wings has been part of the team's six Presidents' Trophy wins. 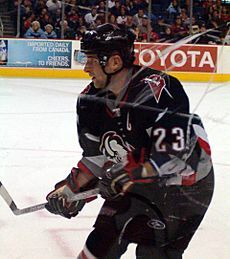 Chris Drury played for the 2000–01 Colorado Avalanche and the 2006–07 Buffalo Sabres. Ottawa Senators Presidents' Trophy Banner from the 2002-03 season. * Team won the Stanley Cup. ^ Team lost in the Stanley Cup finals. # Team lost in a preliminary round of the playoffs. Presidents' Trophy Facts for Kids. Kiddle Encyclopedia.